Cannabis in Oregon relates to a number of legislative, legal, and cultural events surrounding use of cannabis (marijuana, hashish, THC, kief, etc.). Oregon was the first U.S. state to decriminalize the possession of small amounts of cannabis, and among the first to authorize its use for medical purposes. An attempt to recriminalize possession of small amounts of cannabis was turned down by Oregon voters in 1997. From 1999 through 2005, the ratio of Oregonians using cannabis outpaced the general United States population by 32–45%. In surveys conducted in 1974 and 1975—one and two years after decriminalization—it was found that 2% of respondents said they did not use marijuana or cannabis because they were unavailable, 4% for legal or law enforcement reasons, 53% reported lack of interest, and 23% cited health dangers. The remaining 19% were using or had used it at one time. Measure 91 was approved in 2014, legalizing non-medical cultivation and uses of marijuana. It followed perennial, unsuccessful efforts to legalize marijuana by ballot initiative, including in 1986 and in 2012 which made it to the ballot, but voters rejected. In 2015, Oregon Governor Kate Brown signed an emergency bill declaring marijuana sales legal to recreational users from dispensaries starting October 1, 2015. State officials began working on establishing a regulatory structure for sales of marijuana, and taxing of such sales, with the Oregon Liquor Control Commission (OLCC) to oversee it. Effective January 1, 2017, dispensaries were no longer permitted to sell cannabis for recreational use unless they applied for, and received, an OLCC license for such sales. During the one-month span from early December 2016 to early January 2017, the number of retailers licensed to sell recreational marijuana grew from 99 to 260, and hundreds more applications had been received and were being processed. According to the Drug Enforcement Administration (DEA), cannabis is readily available in Oregon. According to a 2006 report by the Substance Abuse and Mental Health Services Administration, in 2003–2004 Oregon ranked in the top fifth of states for cannabis usage in three age categories: 12 to 17, 18 to 25, and 26 and older. In 2005, while most states that had passed medical marijuana bills over the past decade saw marijuana use among teenagers decline faster than the national average (a 43% decrease), Oregon, Nevada, and Maine saw smaller decreases than the average. Oregon imports cannabis from Washington, California, Mexico and Canada, while also producing a large quantity locally. Large indoor and outdoor growing operations have been discovered on private, state, and forest lands, with plants numbering in the thousands. Allegedly large outdoor growing operations run by Mexican cartels drug trafficking were assumed to be operating in remote locations. Highly potent cannabis grown in Oregon is consumed locally, and distributed to other parts of the U.S. In 1988, due to the success of the DEA’s Campaign Against Marijuana Planting in California, Oregon rivaled California nationally in cannabis production. In the 1990s, Oregon was a national leader in indoor cannabis cultivation, along with California, Washington, Kentucky and South Florida. For the decade ending in 1991, the DEA considered Oregon the “nation’s cradle of indoor marijuana growing.” In 2006, Oregon was the fourth largest indoor cannabis producing state, and the tenth largest cannabis producing state overall. In 2007, nearly 20,000 people attended the third annual Hempstalk Festival at Sellwood Riverfront Park in Portland, Oregon. While organizers insisted smoking would not be tolerated, the smell of marijuana lingered in the air and some festival goers chose to consume various forms of cannabis foods. No festival attendees were arrested. The first International Cannabis Business Conference (ICBC) took place in Portland, on September 13 and 14, 2014, at the Oregon Convention Center. The conference brought together entrepreneurs, professionals and advocates from across the globe, with the goal to further mainstream the global cannabis industry. The ICBC is a collaboration between veteran activists Anthony Johnson, Alex Rogers and Debby Goldsberry. Johnson has served as chief petitioner of statewide cannabis reforms and is currently Director of the Oregon Cannabis Industry Association; Rogers is CEO of Northwest Alternative Health and lead producer of the Oregon Medical Marijuana Business Conference; Goldsberry is a co-founder of the Berkeley Patients Group and serves as an ambassador for Magnolia Wellness. The ICBC further cements Portland has a prominent locale for cannabis activism. Amidst a nationwide trend of cannabis prohibition, the State of Oregon outlawed cannabis in 1923. In 1935, the State of Oregon passed the Uniform State Narcotic Drug Act, bringing Oregon’s laws regarding cannabis in line with the majority of states. … the solution is not to toss youthful offenders into jail or prisons. We long ago recognized alcoholism to be a disease, and abandoned efforts to treat alcoholics simply by locking them up. — Oregon Governor Tom McCall, who signed the nation’s first legislation decriminalizing certain marijuana offenses in 1973. In 1973, Oregon became the first state to decriminalize cannabis. Possession of 28.35 grams (1 ounce) or less is a violation (not a crime) punishable by a $500 to $1,000 fine; stricter punishments exist for sale or cultivation. Possession of 1 ounce to 110 grams is a class B felony punishable by 10 years in prison, and possession of more than 110 grams is a felony with punishment depending on the defendant’s prior record. The Oregon Decriminalization Bill of 1973 abolished criminal penalties for possession of small amounts of marijuana. As a result, possession of up to an ounce of marijuana in Oregon was a violation (not a crime), punishable only by a fine of $500 to $1000. There is one exception, however, which is: if possession of such an amount occurs in a public place within 1000 feet of a school attended by minors, the person committing the offense is guilty of a Class C misdemeanor instead. Possession of more than one ounce, no matter the proximity to a school, was a Class B felony until July 3, 2013, at which point it became a Class B misdemeanor. The actual use of marijuana in private, and being under the influence of marijuana, are not punishable offenses under Oregon law. However, public use, and also driving under the influence of intoxicants are punishable offenses. Intentionally growing even one marijuana plant (Unlawful manufacture of marijuana), was a Class A felony in Oregon (ORS 475.856, 475.858) until July 1, 2015. Selling or giving away marijuana was an offense (Unlawful delivery of marijuana) that varied in severity and penalty depending on the amount of marijuana involved in the transaction, whether or not consideration was involved, the relative ages of the people involved, and the proximity of the transaction to nearby schools attended by minors (ORS 475.860, 475.862). Giving away five grams (approx. 0.18oz) of marijuana or less by an adult to another adult for no payment at a location at least 1000 feet from the closest school was only a violation, punishable by a fine of $500 to $1000. However, if greater amounts of marijuana were involved, if any payment at all were involved, if delivery was by an adult to a minor, and/or if delivery occurred within 1000 feet of a school (even if both parties are adults), the severity of the offense ranged from Class C misdemeanor to Class A felony with increasing penalties. In 1986, Oregon’s Ballot Measure 5 sought to legalize cannabis. The Oregon Marijuana Initiative spent about $50,000 promoting the proposition, and collected the 87,000 signatures necessary to place it on the ballot. In 1986, by some estimates, cannabis was Oregon’s largest cash crop, estimated in 1985 at between $1 billion and $1.15 billion. The ballot measure was rejected by Oregon voters with 279,479 “Yes” and 781,922 “No” votes, or 26.33% support. In 1995, Oregon House Bill 3466, which would have recriminalized marijuana in Oregon, died. According to bill sponsor Jerry Grisham (R–Beavercreek), HB 3466 was meant to counter a circulating initiative petition called The Oregon Cannabis Tax Act of 1997, which would have allowed state liquor stores to sell marijuana and permitted hemp production for paper, fabric, oil, and protein. Taxes on these products would go to schools to replace funding allegedly lost by Measure 5. The petition was sponsored by a political action committee named Pay for Schools by Regulating Cannabis. Cannabis activists Paul Stanford and Chris Iverson were the chief petitioners for the Oregon Cannabis Tax Act of 1997. HB 3466 would have increased penalties for possession of under an ounce of marijuana from an infraction (traffic ticket-like offense) to a Class A misdemeanor, the worst non-felony offense, with a fine of $100 to $1,000 per gram, up to a maximum of $5,000. The bill also would have created a new crime—being under the influence of marijuana—punishable by a fine of up to $5,000. The bill would have passed according to the positions of state senators, but was blocked on a technical basis which prevented it from coming to the floor the same day it was read—which allows public input—unless overridden by a vote. In 1997, the Oregon Legislature passed House Bill 3643, making the possession of less than an ounce of marijuana a Class C misdemeanor, which added a possible jail sentence of up to 30 days. According to Eric Schlosser of Rolling Stone, John Kitzhaber, then Oregon’s governor, signed the bill because he did not want to appear soft on crime. Activists opposing HB 3643 collected twice as many signatures as were required to force a referendum on the bill. John Sperling, Peter Lewis, and George Soros were the principal financial backers of the referendum signature drive. Measure 57, which would have upheld HB 3643, was turned down by a margin of 2–1. The Oregonians For Cannabis Reform 2010 hoped to make cannabis products legal and available in a retail environment by enacting the Oregon Cannabis Tax Act of 2010 (OCTA), but the effort failed to collect the minimum 83,000 signatures by the July 2 deadline to qualify for the 2010 ballot. Backers of the initiative say 90% of the proceeds from the state’s sale of marijuana would have gone to Oregon’s general fund (as much as $300 million), lowering the state tax burden, while 10% of the revenue would have been used to fund drug abuse education and treatment programs. Advocates claim the marijuana market would be removed from the underground economy, where young people and drug abusers often take control, and place it in liquor stores regulated by the Oregon Liquor Control Commission (OLCC) so that the minimum age of 21 can be enforced. According to Madeline Martinez, Executive Director of NORML’s Oregon chapter, U.S. Congressman Barney Frank (D–Massachusetts) has endorsed the idea, though support from Oregon state officials has been limited. Oregon marijuana law is further complicated due to the existence of Oregon’s medical marijuana program. The Oregon Medical Marijuana Program allows individuals with a medical history of one or more qualifying illnesses and a doctor’s recommendation to apply for registration with the program. Accepted applicants are issued a Medical Marijuana Card, which entitles them to different treatment under the law. Essentially, medical marijuana patients are allowed to possess, without fear of citation, arrest, or penalty, up to 1.5 pounds of marijuana at a time. Possession of a greater amount, however, does become punishable by law. In addition to legal possession, cardholders may also legally grow, without fear of citation, arrest, or penalty, up to 18 immature cannabis plants and 6 mature ones at a single time. Cardholders are also allowed to designate a primary caregiver and a grower of their choice, if so inclined. These people enjoy the same freedoms, in regard to possession, as the cardholder as long as they remain officially registered. The above limits of legal possession apply to the total combined property of the cardholder, caregiver, and grower. If a grower is growing plants for more than one cardholder, he or she may possess up to 18 immature plants per cardholder. A grower may not grow plants for more than four cardholders at a time. Also, in addition to legal possession and manufacture as outlined above, cardholders, caregivers, and growers may legally deliver marijuana to each other, and to other cardholders, so long as the delivery is made without consideration. The privileges which normally protect cardholders, caregivers, and growers from citation, arrest, and penalty do not excuse possession, manufacture, or delivery in cases where they are simultaneously guilty of certain offenses listed in ORS 475.316, such as driving under the influence of marijuana or using marijuana in public. The Oregon Medical Marijuana Act was established by Ballot Measure 67, a citizens’ initiative, in November 1998, the same election as the referendum Measure 57. It modified state law to allow the cultivation, possession, and use of marijuana by prescription by patients with certain medical conditions. The ballot measure passed by a margin of 54.6% to 45.4%. The Act does not affect federal law, which still prohibits the cultivation and possession of marijuana. Bernie Hobson, spokesman for the DEA’s Seattle regional office, said “From a federal standpoint, there is no such thing as medical marijuana.” Four other western states (Alaska, Arizona, Nevada and Washington) and the District of Columbia passed similar measures legalizing the use of marijuana for medical purposes in the same election. The act created “The Oregon Medical Marijuana Program,” which administers the Medical Marijuana Act approved by the public in November 1998. The Oregon Medical Marijuana Program administers the program within the Oregon Department of Human Services. As of April 1, 2009, there were 20,974 patients registered, with 10,626 caregivers holding cards for these patients. Virtually all patients benefiting from the program (18,000+) suffer from severe pain and more than 3,200 from nausea. The other conditions are given as epilepsy, HIV/AIDS, cancer, cachexia, chronic glaucoma and tremors caused by Alzheimer’s disease. Multiple states have requested information on Oregon’s program to use as a model for their own medical marijuana initiatives and registration systems. In 2004, an Oregon ballot measure that would have increased the amount of cannabis a patient can legally possess to six pounds was defeated by Oregon voters. In 2005, the Oregon Medical Marijuana Program brought in more than $900,000 to the state’s budget for the Department of Human Services. A ballot measure of the November 2010 election would have established a state licensing system for marijuana producers and dispensaries, allowed the sale of marijuana from the dispensaries to medical marijuana patients, provide low income assistance for those patients, and set up a research program to evaluate the effects of the new law. It was defeated with 43.85% support and 56.15% opposition. However, the state legislature legalized medical dispensaries a few years later during its 2013 legislative session. The Oregon Cannabis Tax Act qualified for the November 2012 state ballot, with the petition having 88,887 valid signatures. If approved, it would have legalized marijuana for recreational adult use, regulated and taxed the cultivation and sale of marijuana, and legalized the production, use, and sale of hemp. It appeared as Measure 80 on the ballot, but was defeated by a margin of approximately 53%-47%. Results by county of Ballot Measure 91; green counties voted yes and red counties voted no. Measure 91 was approved in 2014, legalizing non-medical cultivation and uses of marijuana in Oregon starting July 1, 2015. In September 2014, some of the municipalities revealed intention to apply sales tax on recreational use, ahead of it being legalized. Measure 91 only allows the state to tax marijuana, so local governments are hoping they’ll be able to get their taxes grandfathered in if they pass them now. In 2015, Oregon Governor Kate Brown signed an emergency bill declaring marijuana sales legal to recreational users from dispensaries starting October 1, 2015, during an “early sales” period, through the end of 2016. Additional legislation signed into law by Governor Brown in March 2016 allowed the sale of medical and recreational marijuana from the same outlets. Effective January 1, 2017, marijuana can be sold for recreational use only by businesses that have obtained a “recreational license” from the OLCC; such businesses can also sell for medical use. Medical marijuana dispensaries that had not obtained a recreational license were no longer permitted to sell for recreational use after 2016. In mid-December 2016, there were fewer than 100 Oregon businesses licensed to sell recreational marijuana, whereas there were more than 300 medical-marijuana dispensaries (down from a peak of 425). However, the number of applications for recreational licenses jumped sharply in the last months of 2016, and the number of licensed retailers grew from 99 to 260 in the one-month span from early December 2016 to early January 2017. According to the Oregon Department of Revenue, state and local recreational marijuana sales/excise taxes generated $78 million in tax revenue in 2017, up from $60 million in 2016. A practitioner’s action of recommending or prescribing Schedule I controlled substances is not consistent with the ‘public interest’ (as that phrase is used in the federal Controlled Substances Act) and will lead to administrative action by the Drug Enforcement Administration to revoke the practitioner’s registration. Given the doctrine of constitutional doubt, the government’s construction of the Controlled Substances Act cannot stand. The government should be permanently enjoined from (i) revoking any physician class member’s DEA registration merely because the doctor makes a recommendation for the use of medical marijuana based on a sincere medical judgment and (ii) from initiating any investigation solely on that ground. The injunction should apply whether or not the doctor anticipates that the patient will, in turn, use his or her recommendation to obtain marijuana in violation of federal law. The government appealed the decision to the Ninth Circuit Court of Appeals, which agreed with the lower court on October 29, 2002, and expanded the grounds for the injunction to include free speech. The government appealed again to the Supreme Court which declined to hear it October 14, 2003, reaffirming the California Circuit Court’s injunction. In November 2007, a California appeals court ruled that “it is not the job of the local police to enforce the federal drug laws.” The U.S. Supreme Court denied an appeal by the city of Garden Grove in December 2008, upholding the decision. The case began in June 2005 with a medical marijuana patient from Garden Grove being pulled over by city police and cited for possession of marijuana, despite his immediate display of proper medical marijuana documentation. The charge against him was later dismissed, but the city refused to return his confiscated eight grams of marijuana, even after being instructed by Orange County Superior Court. 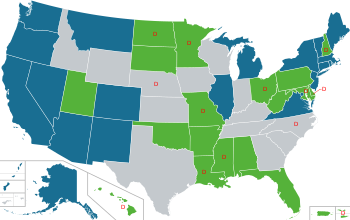 The Supreme Court ruling affects 13 U.S. states with medical marijuana laws. Police departments throughout Oregon decline to press charges, or charges have been dropped for possessing and growing marijuana, even for convicted drug dealers. Salem police estimated they received 30 or 40 calls for marijuana activity in 2007 which were not pursued because the grow operations were legal, even one next to a high school. One grower, a previously convicted felon, was found with evidence of making hash oil, which is not protected, though a grand jury did not indict him. After a federal agent from the Department of the Interior used a thermal imaging device to determine that Danny Lee Kyllo was using grow lamps to grow marijuana in his Florence, Oregon home, the Supreme Court of the United States determined that the use of a thermal imaging device from a public vantage point to monitor the radiation of heat from a person’s home was a “search” within the meaning of the Fourth Amendment, and thus required a warrant. Because the police in this case did not have a warrant, the Court reversed Kyllo’s conviction for growing marijuana. ^ a b Paul Blachly (1976). “Effects of Decriminalization of Marijuana in Oregon”. Annals of the New York Academy of Sciences. Drug Policy Institute. 282: 405–415. doi:10.1111/j.1749-6632.1976.tb49913.x. Archived from the original on 2008-12-01. Retrieved 2008-12-26. ^ a b “Measure 91: Oregon voters pass legalization of recreational marijuana”. KPTV. 2014-11-04. Retrieved 2014-11-04. ^ a b c Danko, Peter (January 9, 2017). “Oregon reports big jump in marijuana business applications, licenses”. Portland Business Journal. Retrieved 2017-02-08. ^ a b “DEA Briefs and Background, Drugs and Drug Abuse, State Factsheets, Oregon”. Drug Enforcement Administration. Archived from the original on August 22, 2008. Retrieved 2008-12-18. ^ “Oregon marijuana use among highest in U.S.” Portland Business Journal. 2006-04-06. Retrieved 2008-12-17. ^ Bailey, Eric (2005-09-07). “Pot Use Down Where Medical Use OK”. Los Angeles Times. Retrieved 2008-12-17. ^ “Oregon Marijuana Statistics”. National Organization for the Reform of Marijuana Laws. 2008-12-05. Archived from the original on April 15, 2008. Retrieved 2008-12-17. ^ Stein, Mark A. (October 3, 1988). “Pot Growers Retreat Inside, Under Lights in High-Tech Battle”. Los Angeles Times. p. 3. Retrieved 2008-12-18. ^ Navarro, Mireya (1996-11-24). “Marijuana Farms Are Flourishing Indoors, Producing a More Potent Drug”. The New York Times. Retrieved 2008-12-17. ^ Solomon, Chris (November 25, 1998). “Smell Of Money Makes Pot A Big Indoor Crop”. Seattle Times. Retrieved 2008-12-18. ^ Soble, Ronald L.; John Balzar (June 28, 1991). “DEA Raids Massive Indoor Marijuana Operation”. Los Angeles Times. p. 28. Retrieved 2008-12-18. ^ Gettman, Jon (December 2006). “Marijuana Production in the United States (2006)” (PDF). DrugScience.org. p. 11. Retrieved 2008-12-18. ^ Budnick, Nick (June 15, 2005). “In Weed We Trust”. Willamette Week. Archived from the original on January 8, 2009. Retrieved 2008-12-18. ^ a b Schiff, Rachel (2007-11-12). “Hidden At Hempstalk”. Willamette Week. Archived from the original on 2007-11-07. Retrieved 2008-12-16. ^ Staff, ICBC. “International Cannabis Business Conference Blog Kauai Berlin”. International Cannabis Business Conference – Vancouver – Berlin – SF – Portland. Retrieved 10 April 2018. ^ “Quotes About the War on Some Drug Users”. PDX NORML. Retrieved 2008-12-17. ^ a b c Schlosser, Eric (2005-12-05). “The Politics Of Pot: A Government In Denial”. Rolling Stone. Retrieved 2008-12-17. ^ “State by State Laws: Oregon”. National Organization for the Reform of Marijuana Laws. 2006. Archived from the original on 2006-11-17. Retrieved 2007-01-10. ^ Phillip Smith (July 3, 2013). “Oregon Governor Signs Marijuana Penalty Reduction Bills Into Law”. The Daily Chronic. Retrieved 2013-07-09. ^ “American Notes Oregon”. Time. 1986-09-29. Retrieved 2008-12-17. ^ “America’s #1 Crop – Marijuana Tops the Charts”. High Times quoted by the Portland NORML. April 1986. pp. 48–49. Retrieved 2008-12-16. ^ “Initiative, Referendum and Recall: 1980–1987” (PDF). Oregon Blue Book. Oregon Secretary of State. Retrieved 2008-12-16. ^ a b c “Recriminalization of Marijuana Dies in the Oregon Legislature—Initiative Petition to Regulate Marijuana Sales Gathers Momentum”. NORML. September 1996. Archived from the original on 2005-12-21. Retrieved 2008-12-16. ^ Kamph, Stefan (July 22, 2010). “Prohibition Deja-Vu: Should Oregon Sell Pot?”. The Portland Mercury. Retrieved 28 November 2017. ^ “June 22 Portland Hemp Fest Update”. MarijuanaLibrary.org. NORML – National Organization for the Reform of Marijuana Laws. May 23, 1996. ^ “Official Results—November 3, 1998 General Election—State Measure 57”. Oregon Secretary of State. Retrieved 2008-12-17. ^ a b King, Tim (2008-07-09). “New Law Would Legalize Marijuana in Oregon”. Salem-News. Retrieved 2008-12-18. ^ a b c Saker, Anne (2008-08-10). “Legal pot backer sees pluses for state, businesses”. The Oregonian. Retrieved 2008-12-26. ^ “The Oregon Medical Marijuana Program” (PDF). Oregon Health Authority. Archived from the original (PDF) on January 16, 2013. Retrieved November 16, 2012. ^ Trappen, Michelle (January 7, 1994). “Marijuana Advocates State Case”. christopheriverson.com. The Oregonian. ^ “Official Results—November 3, 1998 General Election—State Measure 67”. Oregon Secretary of State. Retrieved 2008-12-17. ^ Budnick, Nick (2007-08-03). “Feds strike medical pot growers”. Portland Tribune. Retrieved 2008-12-17. ^ a b “Oregon Medical Marijuana Program (OMMP): About Us”. oregon.gov. 2008-07-25. Archived from the original on 2009-01-29. Retrieved 2008-12-16. ^ a b “Oregon Medical Marijuana Program (OMMP): Statistics”. oregon.gov. 2008-12-10. Archived from the original on 2009-01-22. Retrieved 2008-12-16. Data as of 2009-04-01. ^ “Pot measure fails; gay-marriage ban OK’d”. Seattle Post-Intelligencer. 2004-11-03. Retrieved 2008-12-17. ^ Dworkin, Andy (2010-06-20). “Recognizing medical marijuana, state pharmacy board changes its legal classification”. The Oregonian. Retrieved 2010-06-26. ^ Schnabel, Gary A. (2010-06-29). “News Release: Marijuana is not available by prescription” (PDF). Oregon Board of Pharmacy. Retrieved 2010-09-11. ^ KVAL News (2010-06-17). “Oregon Board of Pharmacy vote a marijuana milestone”. KATU. Archived from the original on 2010-06-23. Retrieved 2010-06-26. ^ “November 2, 2010 Voters’ Pamphlet: Measure 74”. Oregon Secretary of State. Retrieved 2012-02-20. ^ “Oregon Regulated Medical Marijuana Supply System Act, Measure 74 (2010)”. Ballotopedia. Retrieved 2010-11-26. ^ Robert Capecchi (2013-07-08). “Oregon Medical Marijuana Dispensary Bill Sent to Governor”. Marijuana Policy Project. Retrieved 2014-07-23. ^ Healy, Jack (November 7, 2012). “Voters Ease Marijuana Laws in 2 States, but Legal Questions Remain”. The New York Times. Retrieved November 16, 2012. ^ Hunter, Schwarz. “Oregon city looking to tax marijuana even though voters haven’t even decided if it’s legal yet”. Retrieved 13 September 2014. ^ Aachen, Paris (March 30, 2016). “New marijuana law clears way for recreational, medical sales in same place”. Portland Tribune. Retrieved 2017-02-08. ^ a b Lehman, Chris (December 28, 2016). “300 Oregon Dispensaries Could Stop Recreational Cannabis Sales Soon”. Oregon Public Broadcasting. Retrieved 2017-02-08. ^ “Oregon Marijuana Tax Statistics: Accounting Information”. Oregon Department of Revenue. 2018-01-18. Retrieved 2018-02-06. ^ a b c “Conant v. Walters, C-97-00139-WHA, In the United States District Court for the Northern District of California” (PDF). September 7, 2000. Retrieved 2008-12-26. ^ Conant v. Walters , 309 F.3d 629 (9th Cir October 29, 2002). ^ “U.S. Supreme Court: State Medical Marijuana Laws Not Preempted by Federal Law”. Salem-News. 2008-12-01. Retrieved 2008-12-17. ^ Thom Jensen and KATU Web Staff (2007-11-20). “Special Report: Highly legal”. KATU. Archived from the original on 2008-03-25. Retrieved 2008-12-17. Schlosser, Eric (2004). Reefer Madness. Houghton Mifflin Harcourt. p. 66. ISBN 0-618-44670-2.